A total of 2,105 runners took their seats on Saturday afternoon, and that enormous field was quickly carved down to size, leaving us with a star-studded final two tables that included 2009 Main Event Champion Joe Cada, online legend David "Bakes" Baker, poker sage Barry Greenstein, and of course, Polychronopoulos. Entering Day 3 of play here today, the New York native Polychronopoulos had amassed a stack of 1.135 million chips, good for third on the leaderboard as the march to the final table began. A large portion of that stack came courtesy of a huge double knockout as Day 2 neared its conclusion, and with momentum on his side, along with a mountain of chips, Polychronopoulos cruised to the final table. Under the bright lights of the Mothership main stage for the third time in three years, Polychronopoulos went right to work, notching the first elimination of the night and taking control of the table from the start. Polychronopoulos also tangled repeatedly with Joe Cada, losing a big hand to double the man with his banner hanging from the Rio's rafters, before ultimately eliminating Cada in his second fourth-place finish of this young WSOP. When it was all said and done, Polychronopoulos controlled the final table with his preflop aggression and creativity, repeatedly taking pots down with three-bets in good spots. Eventually, Polychronopoulos sent Everett Carlton to the rail in 3rd place, and that set up what a heads-up duel that only lasted three hands. With destiny seemingly on his side, and serenity emanating from every move he made, Polychronopoulos got it all-in against Manuel Mutke holding the , which was dominated by the young German's . A flop of hit both players with top pair, but Polychronopoulos was still looking for ladies, and while the turn failed to help, the hit him perfectly, shipping his second WSOP bracelet in dramatic fashion. Polychronopoulos earned a whopping $518,755 for his win here today, but more importantly, he proved to the poker world that learning to spell his last name just might be a good idea. After all, with two WSOP wins in three years, Athanasios Polychronopoulos has accomplished something few others have, and with six more $1,500 No-Limit Hold'em events still on the docket, the summer is still young. Hand #185: Athanasios Polychronopoulos raised to 250,000 on the button and Manuel Mutke three-bet to 650,000 from the big blind. After a few moments, Polychronopoulos four-bet all in for 4.13 million effective. Mutke snap called for his stack. 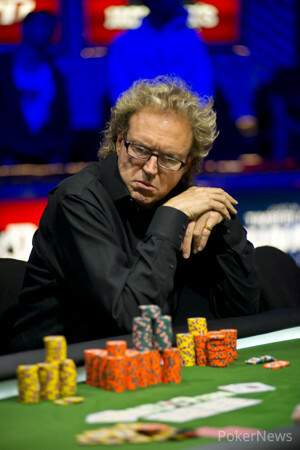 The flop fell , pairing both players but keeping Mutke well out in front. 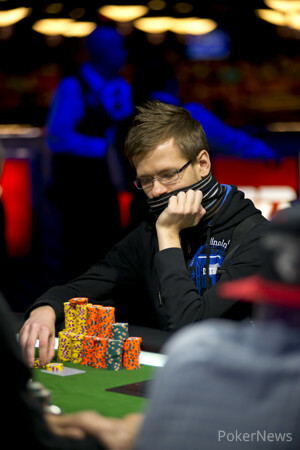 The turn changed nothing, keeping Mutke in excellent shape to double up and take a commanding chip lead. However, the nailed the river and sent Polychronopoulos' rail into absolute pandemonium as their man hit the three-out river and captured his second bracelet. 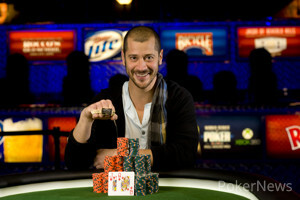 Mutke earned $322,908 for his runner-up finish. Hand #183 Athanasios Polychronopoulos raised to 250,000 on the button and Manuel Mutke defended his big blind. They checked to the river of a board where Polychronopoulos took it down with a bet of 300,000. 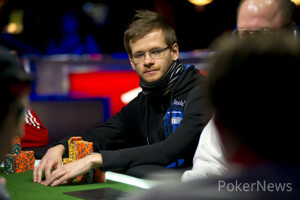 Hand #184: Manuel Mutke raised to 200,000 on the button and won the pot. Hand #182: After Polychronopoulos opened for a raise from the small blind, Carlton shipped his last 2.45 million into the middle, and Polychronopoulos snap-called with , putting him in dominant position over Carlton's . With his rail now screaming for a clean board, the dealer spread a flop of . 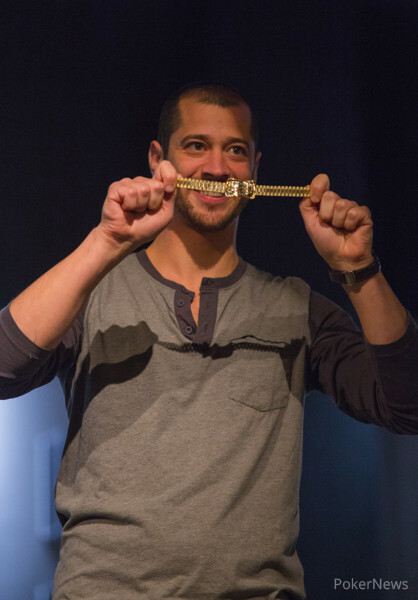 Although Carlton had not found a six, he picked up chop possibilities if the board paired up, but the turn ( ) and river ( ) did not cooperate, sending the WSOP Circuit grinder to the rail in 3rd place. Hand #177: With his boisterous cheering section imploring him to put the hammer down, Polychronopoulos raised his button to 225,000, but Carlton moved all-in from the small blind to force him off the hand. Hand #178: Mutke raised from the small blind and added to his chip lead. Hand #179: Mutke opened on the button, making it 200,000 to go, and Polychronopoulos immediately moved all-in over the top for 2.555 million. Carlton had a decision on his hands, and he went through the scenarios while slowly counting his stack, and that of his opponent. After a few looks across the table were exchanged, Carlton uncapped his cards and slid them to the dealer. Hand #180: Polychronopoulos raised his button to 225,000, and Carlton returned the favor from the last hand, shipping over the top for 2.345 million. Mutke then moved all-in as well, forcing Polychronopoulos to fold and bringing Mutke and Polychronopoulos to a showdown. Both players held , however, and the pot was chopped up after a clean runout produced no flushes. Hand #181: Polychronopoulos received a walk in the big blind. Hand #176: Mutke raised his button to 160,000, and Polychronopoulos reraised to 390,000, staring his opponent down and casually showing off his chip tricks while Mutke contemplated. Eventually, Mutke moved all-in for 2.165 million, and Polychronopoulos snap-called with the , standing and striding towards his supporters on the rail. Mutke's was in bad shape, but he had live cards and lots of possibilities. On the flop, Mutke found a pair and took the lead in the hand, but the on the turn gave Polychronopoulos additional outs to the gutshot straight. With that, Mutke scored a huge double up to survive, taking a chunk out of Polychronopoulos' stack while putting himself in contention for a WSOP gold bracelet.